Reached office bout 8! 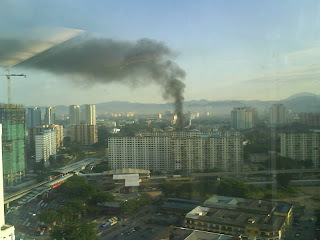 As usual, switched on my computer to let it warming up while i came out to lift lobby and i saw smoke from opposite, eh.. Just behind the perkeliling flat.. Am wondering what happen, i didnt see or hear any ambulance nor fire trucks, hope no one is hurt. Today is a long day for our team. Since yesterday we went mindshare together and it was a good one. Quite a bit of tasks need to be done before weekend. A lot of planning, including how to hit August target. Next month would be the toughest, so far on-hand only got few thousands, and need another 180k to hit! I need money :) Hopefully I could go US in Oct!!! sigh I'm missing the falls.. the steaks.. potatoes.. and wal-mart!! !